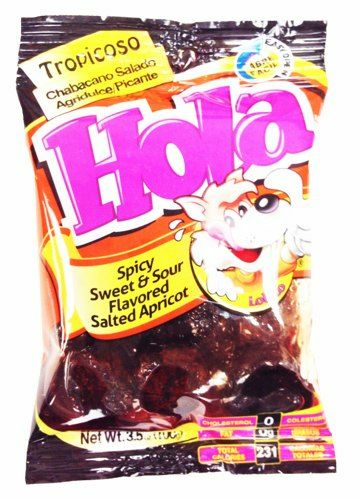 Saladulces Hola are dried sweet and sour flavored apricots that are bathed in spicy sweet and sour flavored sauce, which gives them a taste that is so irresistible you won't able to have just one. Its a fun snack that has a unique tangy taste and the right amount of sweetness to satisfy your tastebuds. What's even better is that these snacks can be eaten anywhere and have many health benefits since they are known to have several antioxidants and are a natural diuretic. What are you waiting for? Grab a bag of Saladulces and enjoy its sweet and sour taste with an ice cold beer. 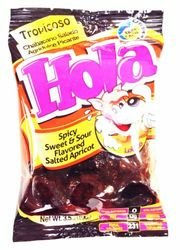 Ingredients: apricot, water, iodized salt, citric acid, chili extract, artificial flavoring and artificial color FD&C Yellow #6 & FD&C Red #40.